Konami Yu-Gi-Oh! Structure Deck Trading Card Game1.0 ea. This item is shipped as an assortment of Structure Decks. Image shown is only representative of what you will receive and may not be the structure deck that will be shipped. 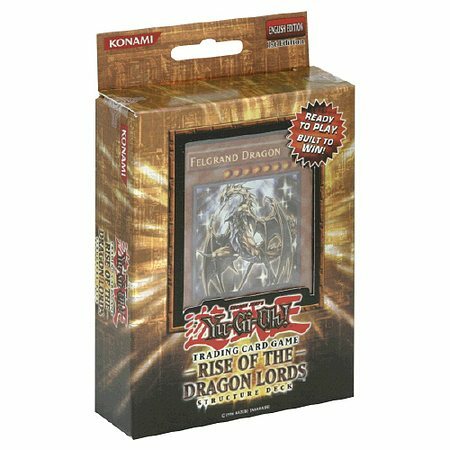 The Rise of the Dragon Lords Structure Deck contains new cards. The more you got, the stronger you get. With Rise of the Dragon Lords you can crush your opponents with barrage of titanic monsters. Easily summon the strongest high-level monster cards that other duelists can only dream of controlling. Master these monster, then raise the power of your game even further with booster packs, to customize and strengthen your Structure Deck.